My goal is to hike at least 5 days each week while staying with Andrea and Ken Slosarik in November and December. The closest uphill hike is at Joseph's Hill where I have performed 5 hikes so far. This a collection from a few of these days. Here is the official description, excerpted: "One of the distinctive scenic backdrops to the Town of Los Gatos is the 270-acre St. Joseph's Hill Open Space Preserve, nearby the urban areas of the southern San Francisco Peninsula. At the eastern edge of the preserve, the top of 1,250-foot St. Joseph's Hill features panoramic views of Santa Clara Valley, Lexington Reservoir, and the impressive Sierra Azul mountain range. 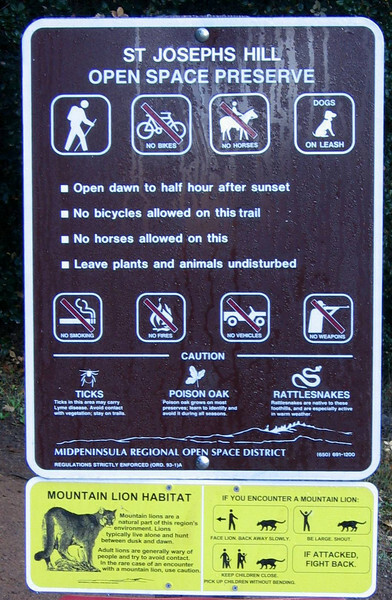 There are a number of regional trails that provide access to St. Joseph's Hill and other nearby open space areas. The Los Gatos Creek Trail provides a connection from the City of San Jose directly into Los Gatos. From there, the popular Jones Trail connects Novitiate Park to St. Joseph's Hill, then to Santa Clara County's Lexington Reservoir County Park. A portion of the Jones Trail follows the historic alignment of Jones Road, which was used in the last century by stagecoaches and pack teams. This was an important route, bringing people, supplies, and equipment over the precipitous St. Joseph's Hill and then down into Los Gatos. St. Joseph's Hill is a popular destination, offering trails that will challenge hikers, bicyclists, and equestrians."